I got tagged by Kaye of Random WAHM Thoughts. 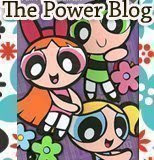 She gave me this super cute Power Blog Award. This is my first blog award, and it really makes my day. 3. Let them know they’d been tagged. I just started blogging actively last September, so I don’t really have that much blogger friends yet. I’ll just list here the owners of the sites I frequently visit. Here’s my list: Wenchie, Rachel, Chateau, Cookie, Ibyang, Gigi, Toni, Mitch, Yin and Resty. ← How Do You Solve a Problem Like No Internet Connection?